Fantasy and humor have always been a large part of my reality–I don’t think I could exist without either of them. My sculptures take on a unique personality and a life of their own about half way through the creative process, something clicks and they’re real. My animated characters became real in a similar way. For me, this is what makes being an artist so much fun. I think I was born loving cats. I became a cat-owner at the age of 7, and have been one ever since. Domestic, wild, or fantastic, they all have the same fascinating blend of power and appeal that makes me want to share my life with them. The Cheshire Cat is thought to have originated as a smiling cat on a pub sign in Cheshire, England. I first met him in Lewis Carroll’s Alice in Wonderland, again in the Disney animated version of those stories, and most recently in the Tim Burton film. I love them all, and had to make my own version. The Cheshire Cat is quoted as saying, “You may have noticed that I’m not all there . . . ” I used this line as the inspiration for my sculpture and as a goal to create a cat in the process of disappearing. The stone is Portuguese Pink marble. This particular block has green vein, which struck me as absolutely wild! 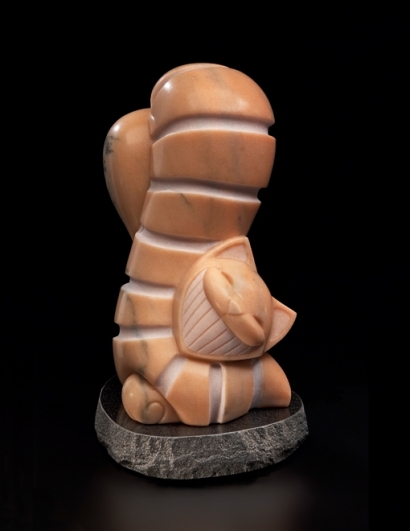 What better stone from which to carve a fantastic cat? The marble is very dense and hard–finishing was a real finger-buster (I still have calluses from sanding) but so worth the effort. The feel is very rich and substantial, quite different from the feel of a softer stone. Just Teasing . . .